The Tigers (18-4, 7-3 Atlantic Coast Conference) used a strong shooting display to build a 16 points lead at halftime, following a 44-28 score at the break, but North Carolina used a late second half rally to come back. 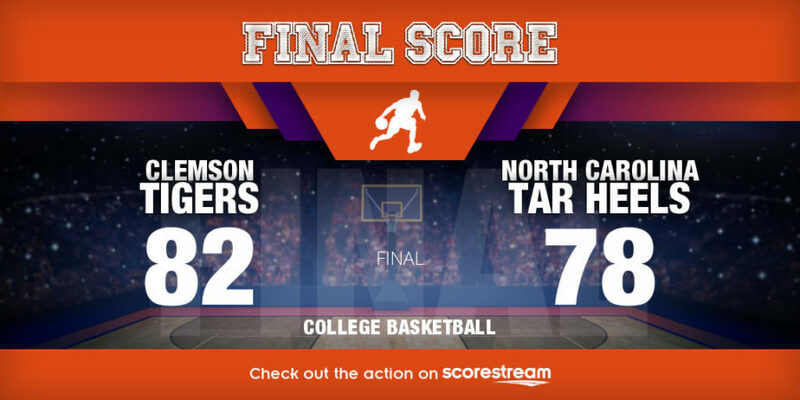 With the game locked at 74-74, after Joel Berry II buried a jumper with 2:07 left in the game, Reed connected on a three-pointer to give Clemson the lead for good with under two minutes remaining and the Tigers went on to end a 10-game losing streak to North Carolina. Reed, who scored 13 of his total points in the second half, also grabbed eight rebounds with five assists as the home club managed to win after blowing its double-digit lead. Prior to Tuesday night’s win, Clemson had lost 10 straight and 20 of 21 to the Tar Heels, according to the AP stats and information. Gabe DeVoe added 17 points and made five of Clemson’s season-high 15 3-pointers on the night. Shelton Mitchell finished with 14 points and Elijah Thomas ended with 11 points with six rebounds and six blocks for the Tigers, who won two straight and three of the last four games. Meanwhile, Cameron Johnson had a career-high 32 points on 10 of 18 shooting with six 3-pointers to lead North Carolina, while Berry II had 27 points on 10 of 16 shooting. Berry II score 19 of his points in a very busy second half performance for the Tar Heels, who played a big chunk of the game without starting forward Theo Pinson, who strained his left shoulder after a hard fall going up for a rebound. Clemson shot just 39 percent, but had 17 assists on 24 made field goals. Head coach Brad Brownell was pleased to see his team resisting the efforts of North Carolina to secure a key conference win over the defending national champion. The Tar Heels were losing three straight games for the first time since the 2013-14 season. North Carolina shot 45 percent from the field and 42 percent from 3-point range. They also outscored Clemson 50-38 in the second half.